Chart No. 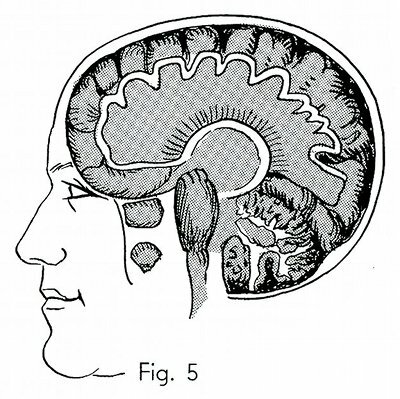 44 - Special Sense Functions of the Brain and Their Representative Locations on the Head. 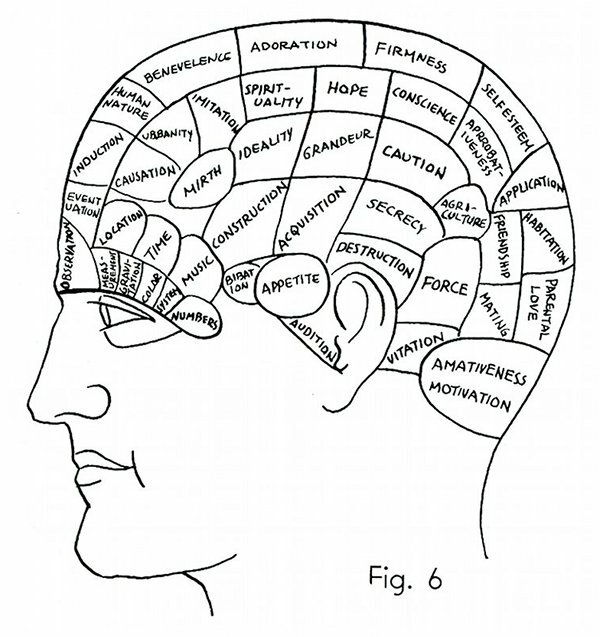 These external areas can be influenced by manipulation to react through the brain as a physiological stimuli. Fig. 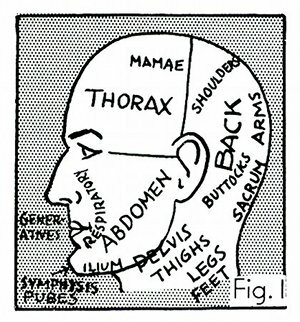 1 belongs to the other chart of anatomical reflex areas in the head. It is left here on purpose, to show the connection between the mechanical aspect of molding bones and its reflexes to the body and effects thru [through] the brain, its convolutions and the cerebrospinal fluid. Figs. 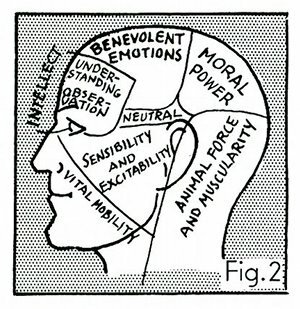 2-3 and 4 give general areas for the expression of the finer quality actions of the soul which manifest as faculties thru [through] the mind and build their respective representative location of organs in the brain to express these mental qualities and impulses. 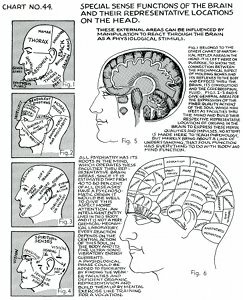 No attempt is made here to teach phrenology, but merely bring about a link of understanding, that soul function has everything to do with body and mind function. 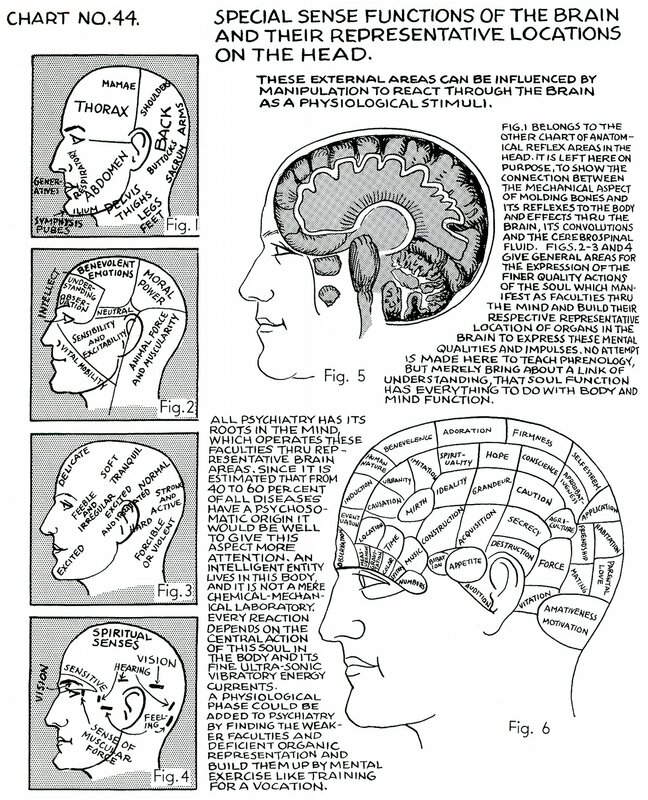 All psychiatry has its roots in the mind, which operates these faculties thru [through] representative brain areas. 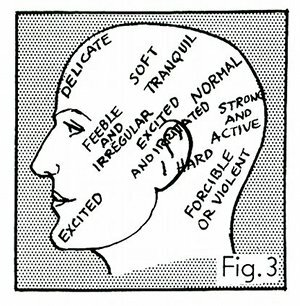 Since it is estimated that from 40 [forty] to 60 [sixty] percent of all diseases have a psychosomatic origin it would be well to give this aspect more attention. An intelligent entity lives in this body, and it is not a mere chemical-mechanical laboratory. 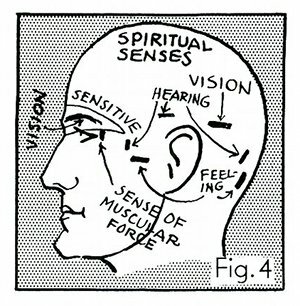 Every reaction depends on the central action of this soul in the body and its fine ultra-sonic [ultrasonic] vibratory energy currents. A physiological phase could be added to psychiatry by finding the weaker faculties and deficient organic representation and build them up by mental exercise like training for a vocation. Book 2, "Explanation of Chart No. 44"